We are delighted to announce that Joel Raymond is attending our Double Reed Day to demonstrate the baroque oboe and tell us about how they are made. Joel has played with the Oxford Bach Soloists, the Hanover Band, the Orchestra of the Age of Enlightenment and the Gabrieli Consort as well as playing abroad, notably with the Australian Chamber Orchestra. 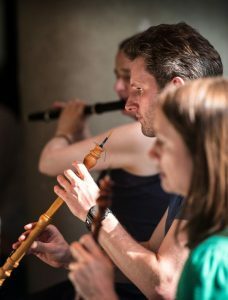 Joel had an early love of baroque music, coming to the recorder as a young player, and took up the oboe in his teens studying at Birmingham Conservatoire, when he took up the baroque oboe. Joel moved on to postgraduate study in historical performance at RAM London and attained the position of joint principal oboist in the European Union Baroque Orchestra. He has studied the instruments used in Bach’s orchestra and has even played some of them, and we are looking forward to a fascinating demonstration at our Double Reed Day on Saturday 4th May. Our Double Reed Day is approaching!